While other analytics methods analyze past events, monitor real-time ones, or provide operational reporting, predictive analytics attempts to divine the future. For this reason, predictive analytics resides at the bleeding edge of data science. But predictive analytics isn’t easy, technically or philosophically. “How do you recognize the inflection points?” asked Thomas Hill, vice president of Analytic Solutions at StatSoft, a 30-year-old data science company that was acquired by Dell in March. Hill delivered a plenary session at the Predictive Analytics World conference in Chicago. Hill acknowledged the most valuable asset in the business world’s surging practice of analytics: people. In manufacturing, predictive analytics is well established and uses methods and technologies that are “well-developed, useful, and suited for real-time,” Hill said. But, based on his experience with StatSoft, a 30-year-old data science company that was acquired by Dell in March, Hill could also explain that there is a need in predictive data science for the human touch, including the experience, instincts, and “gut feelings” of domain experts. In domains that are dynamic, where inputs constantly change and invalidate static models, human intuition is a real asset, Hill said. Predictions need not be perfect to be extremely valuable, they just have to be better than guessing, said Eric Siegel, founder of Predictive Analytics World and author of “Predictive Analytics: The Power to Predict Who Will Click, Buy, Lie, or Die,” an introduction to predictive analytics designed for non-technical audiences. “A little prediction goes a long way,” Siegel said. To illustrate this, he described the value a marketing department would get by using predictive analytics to increase the response rate of an email campaign from 1 percent to 3 percent. Nevertheless, Siegel challenged his audience by noting that most analytic models, such as those used in marketing, predict behavior rather than the influences on behavior and don’t account for what would have happened if no action, strategic or otherwise, had been taken on the activity in question. Such models don’t factor in the individuals who “were going to do X anyway,” like consumers who already intended to buy an item – regardless of whether they received a promotional e-mail – or patients who would have recovered from an illness regardless of whether they received medical treatment. In this sense, individuals are like quantum particles, Siegel said, borrowing a concept from modern physics. Exposing them to some treatment, either a marketing message or a medical procedure, changes their behavior, their sentiment, even their physiology. Because it is impossible to anticipate their response without testing, it is essential to understand outcomes probabilistically, Siegel said. But there is value in imperfect predictive models, said Siegel. By grasping the probability of particular outcomes and then removing the probable “sure things” and the “unpersuadables,” marketers can cut the cost of their activities, focus their efforts, and dramatically increase their success rate. “The standard approach should really be called ‘propensity modeling,’ in that it’s really showing propensity in the context of some treatment,” Siegel said. Chicago’s Predictive Analytics World conference attracted hundreds of attendees. 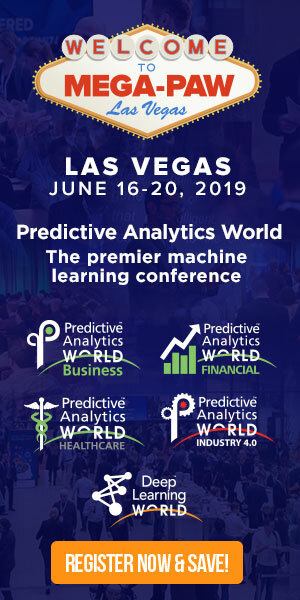 Now in its fifth year, Predictive Analytics World has launched a variety of vertical events, such as predictive analytics in manufacturing (co-located with the Chicago conference), in government, and an upcoming event that will focus on predictive analytics in health care. For details on this and other upcoming big data and analytics events, please visit Data Informed’s Big Data and Analytics Events Calendar. Ellis Booker is a freelance journalist based in Evanston, Ill. Email him at ellisbooker@gmail.com. Follow him on Twitter: @ellisbooker.